A project like Seekay is intentionally anonymous. Much like Squaring Circles, it’s less about personality and all about the music. 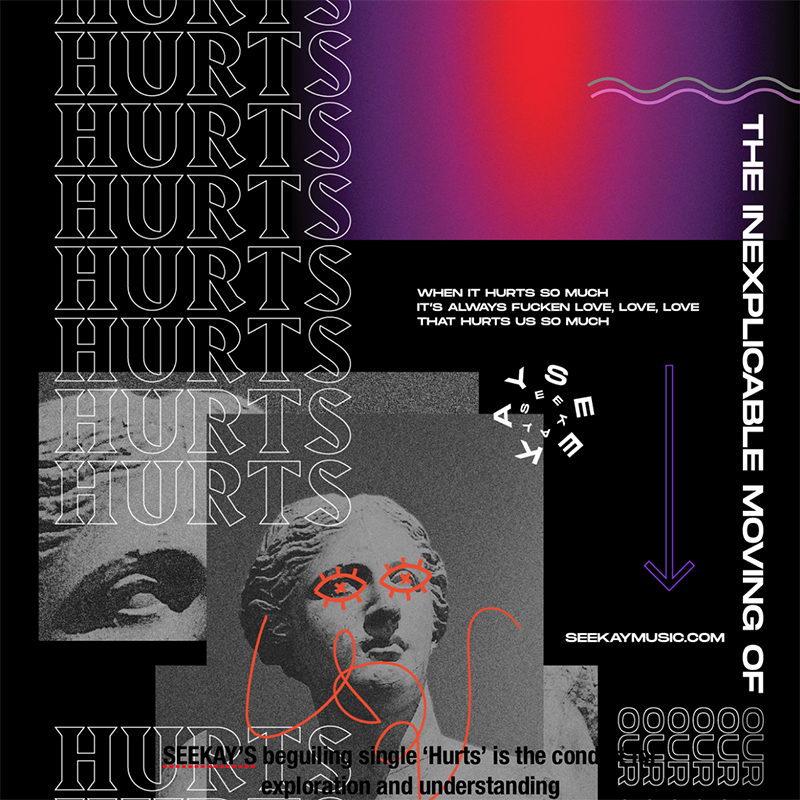 A leading, debut single like Hurts evokes an unheard fissure in electronic music that sparks mystery and pure emotion. We were lucky enough to send Seekay some questions via email to learn more about the project. If possible, I really like my songs to do my talking. Their expression is where I feel most comfortable giving my views and thoughts. I’m also quite a shy, awkward person and I’ve made many mistakes along the road and I’ve finally reached a place where I’m happy in myself and I don’t want that to change really. I prefer people to focus on my work rather than me, I guess. Do my songs move you? Can you relate to their experiences? I’m not going to go overboard keeping my identity secret, my preference is even if you know who I am, judge the work. I am present on social media to connect with fans and answer questions and things but again its less about me, more about what I’m doing work wise. Your voice is buried in the mix, appearing distant. Is this a stylistic choice? It was intentional and part of the production process. Seekay is about the music and lyrics and I hope listeners really take the effort to listen to the lyrics and think about them. I have always been a lyricist and poet and I admire both forms of art, which when supplemented by melody create the most powerful of human experiences. The vox also was suited to the tone/message of the song and the mix I thought and so other songs may see a different positioning. Hurts is labelled as your first “commercial release”. Meaning you’ve made music in the past but not released it? I have been an active songwriter and poet for ages. As I’ve said before, growing up I had a very idealised version of myself and how it was all going to be. It turned out nothing like that and after trying many things the only things that remained constant for me were poetry and songwriting. These were the only parts of my life where I persevered long enough to gain some modicum and sense of of self. Why the decision to lead with Hurts? It’s a combination of electronica and lyrics with a twist. It reflects some things I am going through and have recently come out the other side of… thankfully so it’s very authentic to me. I connect way more easily with electronic music. Can you say the same for yourself? I like all forms of music that through their craft, lyrical prowess and integrity move us. That can be electronic, folk, blues, rock, jazz, experimental, punk, grunge or classical. If you’re choosing to not show your identity, does this mean Seekay will not be a live project? Seekay is very much live, thank you very much! In different ways a low profile as a performer makes the live process far more flexible, accessible and possibly even innovative. If fans want to see Seekay then live performances will occur. I am above all a songwriter and poet. Writing is what I do, who I am.